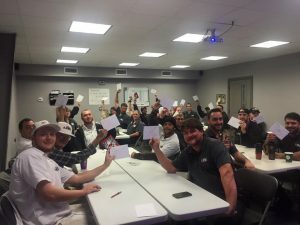 December 11, 2015 – DKI, North America’s largest disaster restoration contracting organization, today announced that one of its member companies, Complete DKI, of Pensacola, FL., spread some holiday cheer by writing and sending 40 holiday cards this week to young Sa’fyre Terry. Over two years ago in Schenectady, NY, a fatal fire killed Sa’fyre’s family and burned 75 percent of her body. The now 8-year-old has only one wish for Christmas – to fill her Christmas tree with holiday cards. When the request went viral on Facebook, Complete DKI’s entire team got together to spread some holiday cheer to this little survivor. “It’s the least we could do for this brave little girl. We hope she gets enough cards to fill her tree and her heart. May this be her most magical Christmas yet,” said Ashlee Carpentier, business development manager for Complete DKI. If you would like to help fulfill this little girl’s Christmas wish, you can send cards to P.O. Box 6126, Schenectady, NY 12306. Or, create a special card for free on www.shutterfly.com by Saturday, Dec. 12, using code: CARD4SAFYRE. Complete DKI is a leading restoration contractor in the Pensacola, FL area with 10 years of experience in disaster restoration. Providing restoration services to commercial, insurance and residential clients, the team is fully insured, licensed, and is registered to do business in Santa Rosa and Escambia counties in Florida and Mobile and Baldwin counties in Alabama. Available 24 hours a day, 365 days a year using the most up-to-date technologies and quality professionals with superior skills and certifications, their customers count on Complete DKI when things appear at their worst. For more information, please call 850-225-5354 or visit www.completedki.com.